BRITISH COLUMBIA – Taseko Mines of Vancouver said on Monday that Montreal-based Osisko Gold Royalties has agreed to pay US$33 million for a 75% share of the silver output from the Gibraltar copper-molybdenum mine. The mine, located about 65 km north of Williams Lake, is owned 75% by Taseko and 25% by Cariboo Copper Corp. 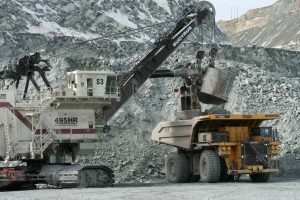 The Gibraltar pit is a conventional truck and shovel operation. In exchange for an initial payment of US$33 million, Taseko will deliver its share of the silver produced at Gibraltar until 5.9 million oz. of silver have been delivered. The amount is approximately equal to Taseko’s share of the silver in current proven and probable reserves. After that threshold is reached, Taseko will deliver 35% of its share of all future silver production to Osisko at a price of US$2.75 per oz. Osisko will also receive 3 million common shares of Taseko with a price to be set at 50% above the 10-day volume weighted average share price at closing, expected to be early in March 2017. The Gibraltar mine is the second largest copper producer in Canada, averaging 138 million lb of copper and 2.6 million lb. of molybdenum annually. The project has a 24-year mine life ahead of it with proven and probable reserves of 749 million tonnes grading 0.256% copper and 0.008% molybdenum with 3.3 billion lb of recoverable copper. There are also measured and indicated resources of 1.1 billion tonnes grading 0.254% copper and 0.008% molybdenum. Details about Gibraltar are posted at www.TasekoMines.com.